It's been almost a decade since my last visit to Rome. I threw a coin into the beautiful Fontana di Trevi, so I'm sure I'll go there again. Rome is one of those cities that can never become boring, where there's always something new to see or to do. As a matter of fact, I can't name a city or a country that I wouldn't want to see again. Once bitten by a travel bug, the sheer thought of going places fills me with the feeling of anticipation and excitement. It's the same fluttery feeling I get in the moment the plane leaves the ground. What to say about Rome that hasn't been said yet? It's unbelievably amazing with a great many of awe-inspiring sights. Every building, every street tells its own story of ages past. And the fountains! Absolutely awesome! It's said that there are about 280 fountains in Rome. My favorite: the three magnificent fountains on Piazza Navona in spring. My childhood memory of Vienna is rather traumatic: in a park near a castle (Schoenbrunn?) I was accidentally hit by a little Viennese girl because I came too close to her swing. She was all dressed up in a dirndl. Luckily, my successive visits to Vienna have been less aggressive and more pleasant, but other people's clothes are more often than not the focus of my attention. I've just uploaded the photos from Minimundus on Picassa and I still can't believe how my sons have changed over those 4 years. They're no kids anymore, well, at least when I compare the past and present photos of theirs. Fortunately, I don't see so many changes (i.e. wrinkles, kilos, gray hair etc.) on me!!!.... uh, just kidding. However, I'm still young at heart. This is another good thing of being a teacher - the students simply don't let you grow old... or am I kidding myself again???? 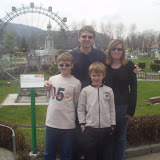 Anyway, it was back in 2003 when we had a lot of fun in this terrific park called Minimundus, near Klagenfurt in the west of Austria. Around 150 models of the most beautiful buildings, bridges, castles, towers, churches... from all the continents can be admired there. Close attention is paid to each and every detail of the models, set in the masterfully designed landscaping.